This is the second part of the China Series, check out the first part here. I arrived at the Shanghai Pudong airport on the 23rd of June and realised I was the only black person on my flight. The signboards were in Chinese Characters and I was soooo scared. I had never been to a country where the signboards were in a different language. My university organised a Bus to take us from the Shanghai airport to Ningbo, where the Campus is. Elise was one of the first friends I made. Yummy Coffee Cafe was the spot where we had our first meal in China. We then went back to our rooms where I skyped my friends & family, unpacked and prepared myself for what was to come. The tuck shop on Campus sold International Brands with Chinese Characters. I wonder why these chip brands don't have a Universal colour to represent flavours. E.G. Salt & Vinegar for Walkers is in a Green pack but Salt & Vinegar for Pringles is in a Blue pack. We went back to Yummy Coffee cafe in the evening for a welcome dinner with the other students. I learnt to use chopsticks by fire by force. Looking at these pictures makes me hungry, the food was legitimately delicious. We were introduced to our teachers too. The next day we were taken to the city for breakfast. Egg boiled in tea is a popular delicacy but I didn't try it. I no bold reach that side, didn't try the custard-y, oat-y, tapioca-y dishes either. I found this umbrella storage system really interesting & unique. I like the fact that there is a key so no one can steal your umbrella when the weather is dodgy. Don't you think this will be a welcome addition to your School/Office? I really can't remember what any of the characters mean, Asian Languages aren't easy mehn. I loved the Ice Cream trucks and they were particularly useful later on in the trip when we had to climb loads of stairs to reach the top of a Buddhist mountain. The weather in the first week was pretty wet, which we didn't expect. It became warmer and hotter by the second week though. The basketball court was pretty popular among the guy's, I probably only went there once or twice. I think I played tennis once too. Have you been to any country where English isn't the main language, which one? There are at least 4 more parts to this China series, hope you're enjoying it so far! Awwwww. You've actually been to China!! We had a Chinese new year event at work recently, and I got all fascinated with China, the Etiquette and the Fun Facts. I actually did a blog post on it, and I really want to go. I've been to France. They do not like to speak English, so it was quite tricky getting around. Also in the Netherlands and Spain, very few people speak English. But I loved these visits though! Awww, will check out the Blogpost, it's a really interesting country with a lot to offer! Your trip looks amazing! I would have totlly tried the eggs cooked in tea tho! 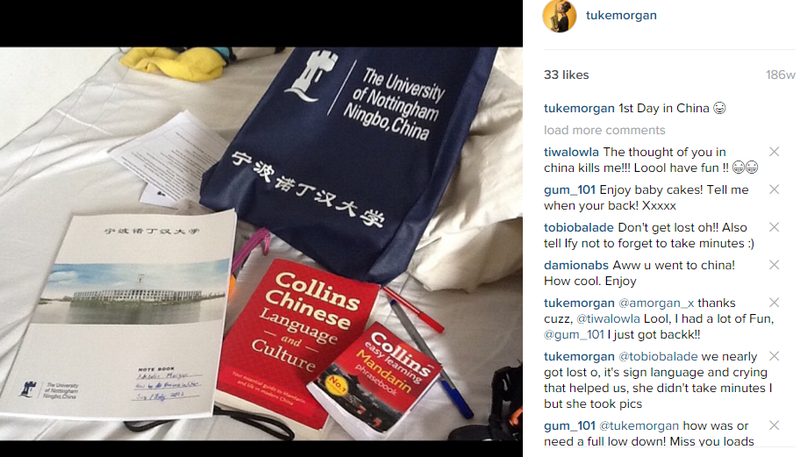 Wow Tuke ,China that sound so farrrrr. I would love to visit China. I desire to take a year out and just travel to see the world. It was a long journey but it was worth every bit of it. I actually don't mind being in the air for many hours. A year out to travel round the world sounds like an amazing idea. Many people do it after A levels, before Uni and it's called a Gap year, I didn't see the benefit of it then but now I do. It's a chance to try out different opportunities, discover the world, discover your strengths and then know what it is you want to focus on at Uni. The typical Nigerian Mentality is to just finish school fast fast and start work but that isn't always the best way. Waiting on the rest of the series! I don't like boiled eggs in the first place, now boiled eggs in tea? NAH MEHN! The rest of the food though! Not helping my currently renewed weight loss efforts. The only non-English countries I've stayed in for more than a day are Holland, France and Benin Republic. Google helps a little bit. Eyah, I've been watching and enjoying your Snaps. I haven't been to France or Benin but I plan to visit both places this year. I passed through Holland when I travelled with KLM, didn't have the chance to explore the city though, soon come, soon come! Aww that's a great testimony. These pictures are really great, China is currently on my wanderlust list. Yes it is, Thank you Demilade! So i stumbled on your blog post after running a search on UNNC. I just got an admission offer to do an MSc programme there. I was doing a little fact finding about living and studying in china when i came across their internet resriction policy, and just reading one blog post about it ruined my day. I kept wondering how will i survive without facebook, twitter, google etc. I just needed someone to tell me i could freely use the internet in ningbo campus, so i jumped on your post to see if i would get any clue. Seeing your skype call picture was a relieve... but the i hope you will share about this. (thats the experience i want to hear more about) access to social media and other websites that are acclaimed to be blocked in china by thier great firewall. Your story is already getting me pumped and excited about resumption at ningbo. Recently I downloaded 2 apps already to help with learning mandarin.. So social media platforms like facebook are blocked in China for certain reasons, but there are proxy's you can use to help you access them. I've got a friend who is currently doing his 2nd degree there, he did his first degree at the UK campus. If you send an email to tuke_morgan@hotmail.com, I'll give you his number so you can ask him questions and he can give you advise. Thanks.. Have sent you a mail already. I would have gone for the "custard-y, oat-y, tapioca-y" dishes. I always go for the least familiar dishes; after all, life is too short to eat the same thing all the time! But the eggs boiled in tea??? Big NO!!!! Wow, you're adventurous when it comes to food o! I'm a bit too chicken at times, don't want to be spending time in the toilet.